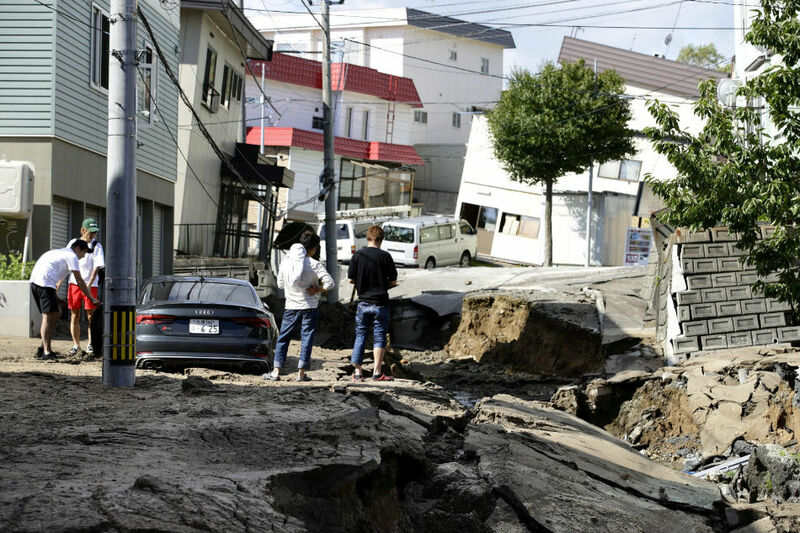 TOKYO - A powerful 6.6-magnitude quake rocked the northern Japanese island of Hokkaido Thursday, killing at least 8 people, collapsing homes, and triggering landslides that left dozens missing. Around 3 million homes lost power after the quake damaged a major thermal plant supplying the region. Kazuo Kibayashi, 51, a town official at hard-hit Abira town, told AFP: "There was a sudden, extreme jolt. I felt it went sideways, not up-and-down, for about 2 to 3 minutes." Akira Fukui, from the main city of Sapporo, told AFP: "I woke up around 3 a.m. with a vertical jolt. I put the light on but it went out shortly afterwards. All the traffic lights are out and there's no power at work." No tsunami warning was issued after the relatively shallow quake, which struck 62 kilometers (39 miles) southeast of the regional capital Sapporo. Around 20,000 rescue workers, including police and members of the Self-Defense Forces were responding to the disaster, government spokesman Yoshihide Suga said. Another 20,000 SDF troops are expected to join the effort.